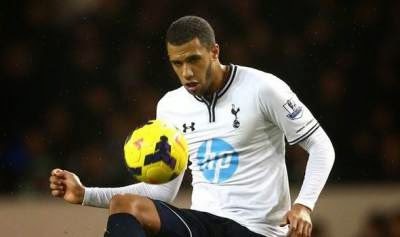 Etienne Capoue has unfortunately been out for two months after breaking into the side but has now returned to training. Back in September he had a Malleolar injury which kept him out for the whole month. What with injuries, getting fit and then having to prove himself to two different managers he has played only 686 minutes of Premier League football which equates to 7.62 games and 1,193 in total of competitive football which equates to 13.25 full games. His attitude was questioned by Tim Sherwood after he took over from Andre Villas-Boas and Etienne told the French press this was the first time he had not been an automatic choice, he wasn't used to it and Spurs were playing him out of position. He wanted a move away from White Hart Lane and agitated to get one. If you remember he had to fill in at centre-half because of all our injuries. His attitude had to change however when a move didn't materialise so he had to knuckle down or face not going to the World Cup. Tim Sherwood basically told him to just get on with it and prove he's good enough after Capoue had complained the English don't understand foreigners. "I don't see him as a centre half. I see him as a central midfielder. "Obviously he's here until the end of the season and hopefully he'll get enough chances to prove he's good enough to play in his national team at the World Cup." When asked what Capoue needed to do to get into the team Sherwood as usual told it like it is. "Just play and train well and show that he's as good as what's in front of him - that's how it is. "Whatever we are left with after deadline day, it's pretty much a clean slate. I'm not going to pick anyone just because he's English or French." Knuckle down he did and forced his way into the side. He was just starting to get regular games when he had to leave the field after just 13 minutes against Norwich City with an ankle injury. He was visibly upset and I suspect knew he had an injury that was likely to keep him out for a while, at least that was the impression I had at the time. 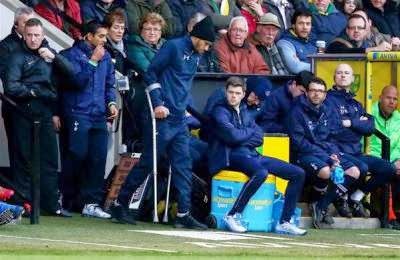 After treatment he returned to the bench on crutches to see Spurs lose 1-0. The following day he had a scan and has been recovering ever since. With so little time left before the end of the season it will be a battle to get fit in time and get some game time under his belt. "It's great to see him back in training but he has been out for two months, so we have to be careful. We'll continue to monitor him closely." With a World Cup looming Capoue will be hoping to get some game time at least and will no doubt also feature in the Ledley King testimonial game at the end of the season. 0 Response to "Can Capoue get fit in time"